Yes it is difficult to score 20+ goals in a single season of the StarTimes Uganda Premier League but the midfielder turn forward is on course to achieving exactly that. On Tuesday, he scored his 18th and 19th goals of the 2018/19 campaign as Police FC defeated Onduparaka 2-1 at Lugogo. 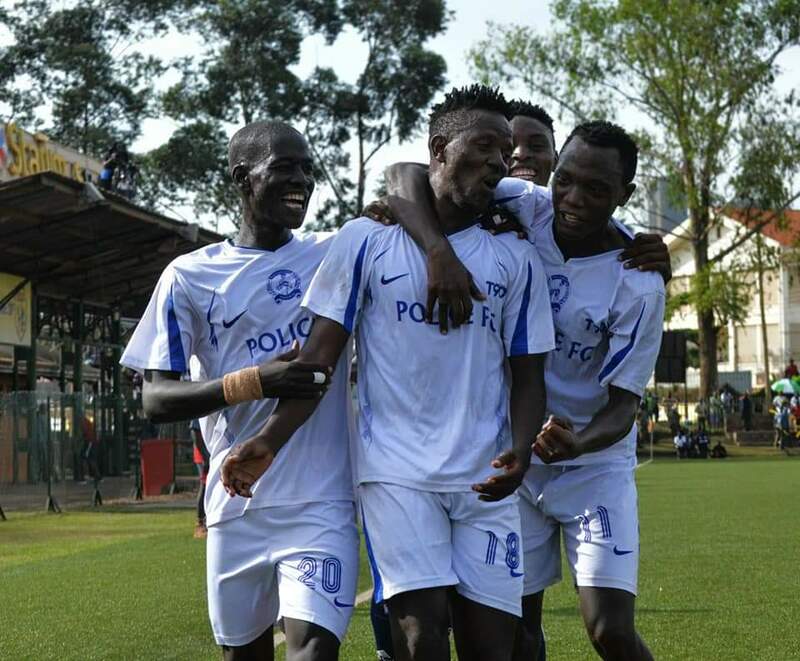 Having endured a 5 game winless run against the Caterpillars, Police who drew 2-2 away to Maroons prior to Wednesday started the game strongly as they attacked relentlessly. However, they had to wait until the 37 minute for the breakthrough as Balinya scored his first goal from a direct free kick. Five minutes later, the former Vipers midfielder was at it again, curling another free kick into the back of the net to ensure his side held a 2 goal caution at the break. 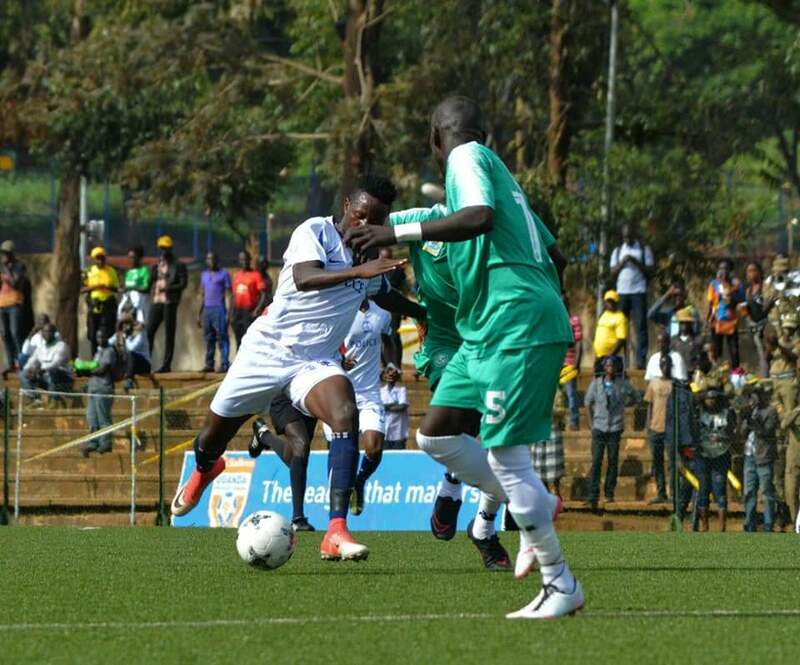 Balinya (left) tries to get past two Onduparaka players on Tuesday. At the start of the second half, left-back Arafat Galiwango was booked for a reckless foul as Onduparaka pressed for a first goal. It would eventually come four minutes to the hour mark through pacey forward Viane Ssekajugo. Despite conceding with over a quarter of the game to play, the Cops held on to win the game 2-1. This was their 10 victory of the season and second in a row at home following the 4-2 win against Paidha last time out. The three points earned see Police move into 8th on the standings with 36 points from 26 games. For Onduparaka, the remain in 7th on the standings having gathered 37 points with four games to play. In the game played at the Arena of Visions, Ndejje University gave themselves hope in their survival bid as they overcame Nyamityobora 3-1. Robert Esenu handed the home side the lead on 36 minutes, one they held until the break. In the second half, Isaac Kisujju struck twice inside 14 minutes with the first coming on 63 minutes and the second on 77 to hand the Students a vital victory in the season. Before Kisujju’s second, Nyamityobra had temporarily reduced the deficit to one, through Joseph Akandwanaho on 71 minutes. In the end, it was Ndejje smiling as the still believe they can survive the drop while Nyamityobora staring in the eyes of relegation. Ndejje now moves to within two points of safety after accumulating 24 from 26 games. For Nyamityobora, they will be relegated if they fail to win their next League fixture. The Abanyakare have 17 points, 9 points behind Maroons who sit 13th on the standings. -Paidha Black Angels 0-2 KCCA FC.